How is giving kids consequences different from punishing them? To some parents, yes. But here’s how I see the (often subtle) distinction between consequences and punishment. Getting clear on the difference has changed the dynamics in my family. I started thinking about consequences vs. punishment while I was writing about holding older kids accountable for doing their chores. When I punish my kids, their attention stays focused on me. You’re mean! and You’re so unfair! and What’s your problem? Even when they know they’ve done something wrong, they’re so fixated on the punishment they have trouble seeing past it to the cause. Lots of arguing; little, if any, learning. But when my kids experience the consequences of their behavior, they are more likely to think about how they could have done things differently. The conversation has a decidedly different tone. I do less enforcing, and more observing. I’m not saying there’s zero arguing and it’s all calm and pleasant, but we can usually come away with a plan for how things will go differently the next time. Here’s an example of a consequence. My daughter brings a hot lunch to school every day in an insulated container. When she comes home from school, one of her chores is to empty and hang her lunch bag, rinse out the container, and put it in the dishwasher. (Bless you, Thermos FOOGO, for being dishwasher-safe). She used to forget to do this almost every day. I used to punish her (mostly by yelling), which left us both feeling frustrated and did nothing to improve the situation. Now, the consequence for forgetting to clean her lunch container is eating lunch in the school cafeteria the next day. She’s not crazy about cafeteria food so now she’s much more likely to remember. It took a while, but she hardly ever forgets now. Sometimes the difference between a consequence and a punishment is the tone in which it’s communicated. Her internal response: You know how much I hate school lunch! I’ll be hungry all day at school! That’s so mean! Her internal response: I’m not crazy about school lunch, but I can see your point. Can consequences be positive? Is a positive consequence the same as a reward? In Punished By Rewards, Alfie Kohn says it is — anything kids get as the result of doing something inevitably blunts their learning and erodes their intrinsic motivation. But I don’t think it’s so black-and-white. While I agree that rewards can complicate matters (think: the kid who won’t use the potty unless he’s promised an M&M), I can think of many other times positive consequences drive a life lesson home. My son earns pocket money by doing odd jobs in the neighborhood. Positive consequences for a job well done: money, getting rehired, neighborhood goodwill and respect. Negative consequences for lack of responsibility or quality: dwindling income, awkward interactions with “hiring” neighbors. The maturity and experience he’s gained from both his successes and failures is priceless. I realize that payment for neighborhood jobs isn’t the same as parent-selected consequences. But what happens at home is training for future independence. It all goes into the same “growing up” bucket. If my kid takes his cell phone out while we’re eating, he loses it for the rest of the evening. The punishment is quick, straightforward, and does its job. We’ve discussed the importance of this rule many times, so at this point, if someone chooses to break the rule, they know what will happen. 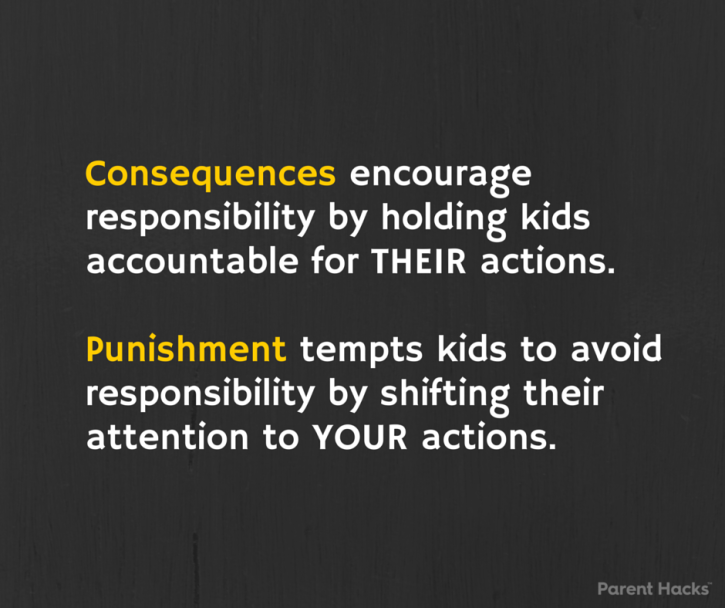 Has your approach to consequences vs. punishment changed as your kids have gotten older? (Ours has — the distinction made no sense to my kids when they were younger.) 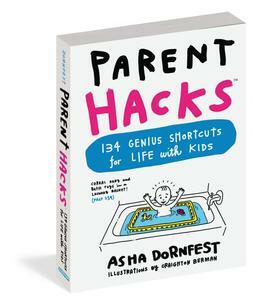 Do you think I have a point, or is this just an exercise in parenting semantics? Standard disclaimer on all of my advice: You know yourself and your family best. What works for me may not be right for you. I offer my opinion in the hope it helps, but if it misses the mark, at least we have something to talk about. Leave a comment! The basic rule I’ve used about when to use rewards is, when I’m trying to establish a habit, or especially, break out of the rut of a bad one. For a few weeks I was giving my son a $1 Matchbox car for using the toilet, instead of hiding behind a curtain and pooping in his diaper. When we stopped doing this he had a lot of cars, and no inclination to resume hiding. A couple of years later I promised him Plants vs. Zombies if he could go to sleep on his own 5 nights straight, which he did with very great but gradually decreasing difficulty. We raised both our children without punishments of any sort. It was my idea and as I was the primary care-giver in our house, my wife was cool with the experiment (which never ended because we liked the results)… Instead of punishing, we dealt with unpleasant behavior by validating it first, empathizing with it second, explaining our feelings about it third, then lastly expressing our desire for change. Sometimes the kids chose to do the same thing again, but that was rare, and when it happened, we repeated the steps of validate/empathize/explain feelings/express desire for change. And now the kids are both in college and looking at them now, I have *zero* regrets. They are happy and emotionally healthy and stable and mature. — I’m not judging others who punish, but I am making the case to new parents to consider abandoning the punishment model altogether. I couldn’t agree more. The difference between a punishment and a consequence is that outside of the family, when you do something you’re not supposed to do, or don’t do something you are supposed to do, the world, nature, other people, cause consequences to happen. If you forget your bus pass for example, the bus driver isn’t punishing you by not letting you on the bus. Not being able to get on the bus is simply a consequence of not having your pass. In a sense, a punishment is something that is brought about, there is agency behind it. A consequence on the other hand naturally follows an action (or inaction). “Nature”- whether mother nature, social convention, or whatever- meets it out. There’s no one to blame, so as you say, the focus shifts to what caused the consequence, and away from the person administering the punishment.